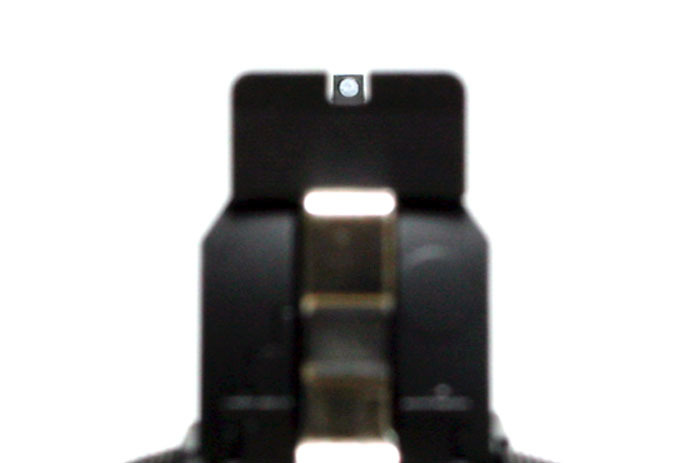 The rear sight of a TM 5.1 Hi-Capa. Turn the screws clockwise to move shots down or to the right, and CCW for up or to the left. The sight picture of a TM 5.1 Hi-Capa. The tops of the front and rear sights should be level, with an even gap between both sides of the front sight. The rear sight of a TM M733, only to be zeroed for windage to the left or right. The sight picture of an M733 Commando. The human brain is inherently able to center the front sight post even with a larger aperture without affecting accuracy. 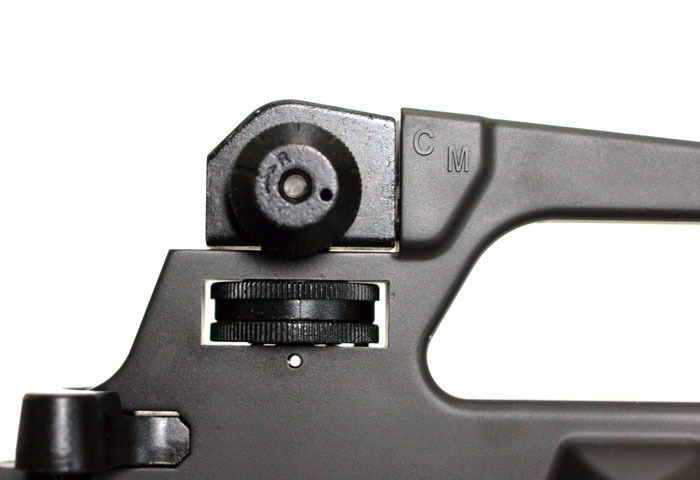 The rear sight adjustment is marked to the knob. Clockwise moves shots to the right. The elevation dial can be used to compensate for range. The front sight is used to zero an AR-15. Turning clockwise makes the post sink into the sight base, shifting shots higher (up). Here the average point of impact is a little bit low and quite a bit to the right. How do you adjust the rear sight or front sight to compensate? Find out in the text! Instead, put the tape on the solid side to offset the ring. Be careful not to overdo this though! The scope rings have some room for "shimming", since they already have scratch protectors. Tape on one side of the scope can guide the tube in the desired direction. "My gun is so inaccurate! I want to buy a precision barrel!. Hey, how come that guy with a stock Tokyo Marui is getting all the frags?!" Sounds familiar? Failure to zero the sights is a fairly universal problem, and leads to frustration because you're not hitting the opponents quickly. Sure enough you can follow the stream of BBs and use that to "aim", but with the BBs easily taking a second to reach even medium ranges, it's an inevitably slow method. By the time you've got the direction right, a fast-moving opponent won't be there anymore. Before even thinking of zeroing the sights, the weapon should have the trajectory it will have when you use it. Most airsoft guns have hop-up, so be sure to adjust the hop-up (or select the right BBs if the hop-up is a fixed one) before zeroing. There are no rules to adjusting hop-up: What works for you works. Some people like a bit more hop, some less. Remember that if you use less hop-up, the BB trajectory will be closer to an even curve, so you can elevate the rear sight to compensate for that and extend the range. It is advisable to hold the weapon as level as possible when you shoot the adjustment shots: If you point it down ever so slightly, you may end-up setting the hop-up too high, as the BBs will first dive, then rise to the sight level and finally above it. On level ground you may actually achieve some "floating" extra range like this, but if you are shooting prone you could end up hitting the ground instead of your target - and when you'd aim higher, the BBs would go over the heads of your targets as if they had a force shield surrounding them! The important part is to set your hop-up to the setting and use the same BBs you'll be using in the field. Due to the effect of hop-up, even a slight tilt of the weapon to either side will cause the BBs to curve in that direction. You wouldn't believe how many times we've heard a right-handed person say that his shots are curving to the left! Adjusting open sights is a rather intuitive and simple process, even though there are lots of different types of open sights. In some cases you adjust the rear sight only, sometimes only the front sight is used for adjustment. There are also cases where one sight is used for adjusting elevation (up/down), and the other for windage (left/right), but you can always easily figure out what the adjustment actually does. Often called M16s or M4s or Armalites (referring to one of the brands and the original manufacturer), the AR-15 sights are rather easy to zero without special tools - although turning the front sight is even easier with the designated tool. Elevation is adjusted with the front sight, while the rear sight is the one adjusted for windage. In modern models such as the M4A1 and M16A2, the rear sight can also be moved up and down. This is used to compensate for range, and is not meant to be a means to zero the weapon. Holding the title of the second oldest assault rifle in the world, the AK is numerous in variants. While some models have interesting sights, most of them follow the same pattern and are zeroed for windage and elevation in the front. 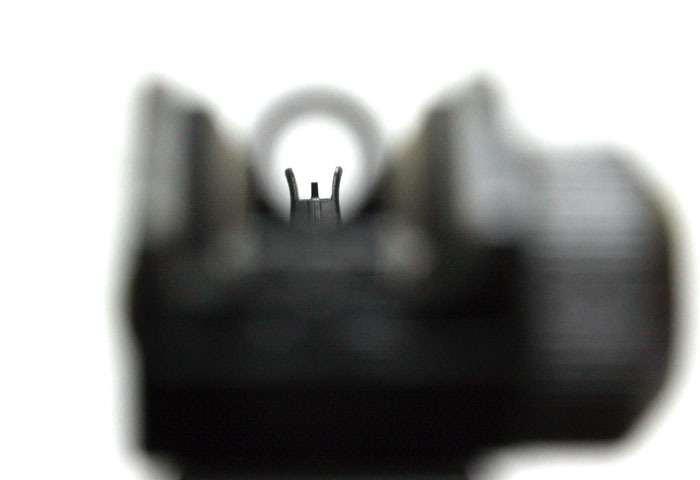 The rear sight can be set for range up to very optimistic distances. Setting it to 800 meters does not mean "MAXIMUM POWA! ", as some combatants in Rhodesia claimed in the early 80's. 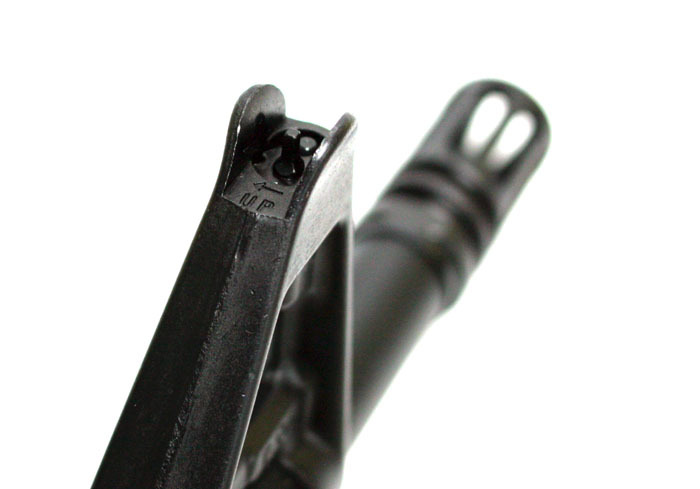 Most airsoft AK's come with an adjustment tool for elevation, but adjusting the windage is a bit more of a task. In the Tokyo Marui AK the entire front sight base is moved coarsely after loosening a screw below the barrel, while on Real Sword Type 56s the adjustment is done with a specific tool to the sight post base, as on the real thing. The SIG assault rifles have the heart of an AK beating inside them, with more user-friendly ergonomics and precise Swiss manufacturing. They are an interesting example for this article, since they are zeroed entirely with rear sight adjustments. The SIG series from Tokyo Marui are credited for good accuracy and the iron sights are a pleasure to use. The rotating drum has various apertures for range. Although your local politican may think all handguns are offensive, they are most of the time a defensive weapon rather than an offensive one. As such they are used at close ranges where accuracy isn't that critical. The short sight radius and barrel as well as a lack of stock makes them less accurate than long arms, and simply technique can shift the Point of Impact more than slight adjustments. Many airsoft pistols have fixed sights even when they appear to be mounted in a dovetail groove, but there are exceptions as well. 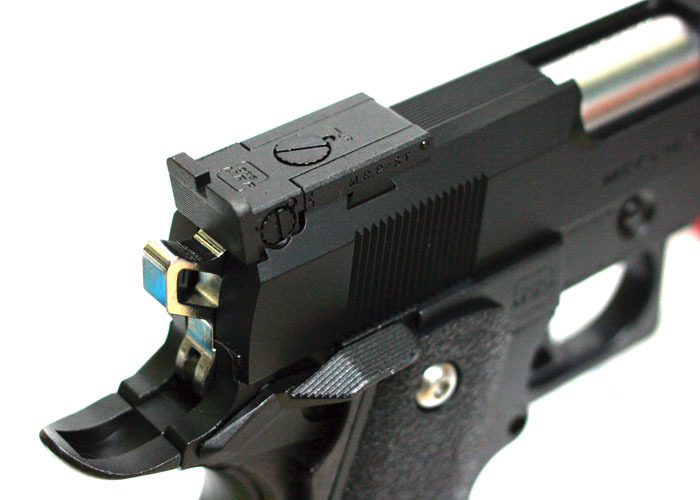 Models such as the Tokyo Marui Hi-Capa and other sport pistols most often have adjustable rear sights. Scopes with magnification are typically used for rather long ranges. Especially a large magnification (3-4x and above) makes it difficult to aim with both eyes open, so the other eye is closed. While the relative lack of accuracy of airsoft guns doesn't really warrant a scope to be used, it is often handy for spotting opponents and tracking the BB flight beyond the eyesight of the naked eye. 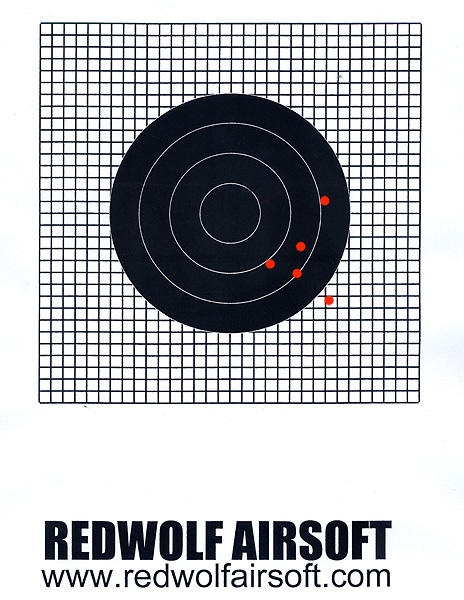 Red dots are more like an advanced version of open sights, and are used similarly with both eyes open. Instead of aligning the target, front sight, rear sight and your eye, you only need to align the target, the dot and your eye, which is faster. Red dots also give you a benefit of being able to aim even in twilight, where iron sights are often hard or impossible to see. 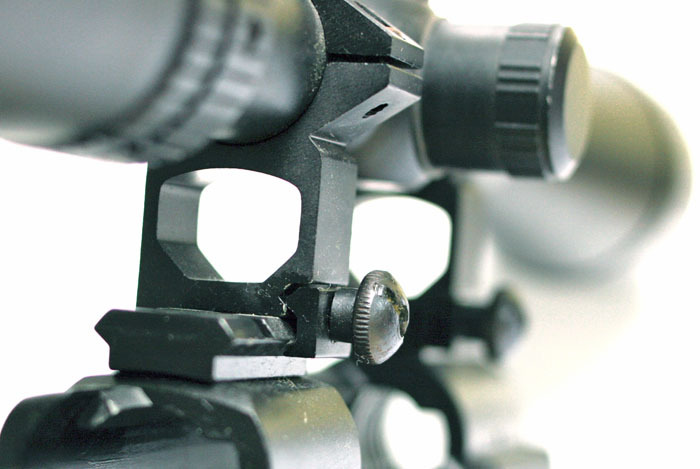 Optics most often have elevation and windage knobs on the top and side respectively, but it is not a universal standard as to which way the adjustment dial is turned for the desired adjustment. For this reason you either need to break out the manual, or make a large adjustment and see what effect it had. Because the line of sight is never the same as the bore axis, the weapon has to be zeroed to a certain range. The line of sights is straight while the projectile flies following a ballistic trajectory, so the BB should cross the line of sights once as it's going up, and another time when it's coming down. If you choose a too long range for zeroing, an airsoft gun may not be able to produce reasonable groupings repeatedly, and you'd be wasting your time trying to determine an average point of impact from shots that are more than a foot apart from each other. You get the best range when you arc the shots by adjusting the weapon to shoot high. But if you overdo it, you might shoot over a target that's at a closer range, so be careful about that. There are ballistic computers to calculate the trajectory with real firearms, but hop-up (especially as people use various settings) throws all calculations out of the window. It is easiest to shoot targets at various ranges to determine the trajectory of your airsoft gun. As a rule of thumb, a good distance for zeroing is 20 meters (65') for long guns and 10 meters (33') for handguns. When you hit the point of aim at these distances, you will hit anything at longer ranges as well, limited only by the maximum flight distance of the BB. If you have difficulty producing a reasonable grouping from these distances, it is advisable to double-check that the barrel is clean and the BBs used are high quality and clean. Shooting should be done from a rest or support of some sort to minimize human error, but shooting off-hand is also advisable for reference. Choose a location where you are not disturbed (and others are not disturbed by you! ), preferably with as little wind as possible. Bring enough targets, make sure your battery is loaded or you have enough gas, or whatever you need to keep the weapon running. A ruler, pen and paper are great for taking notes for future reference. Zeroing is started by shooting a grouping of five shots with the weapon "as is", so you know where to adjust the sights to begin with. If you can't hit the target at all, move closer to the target or alternatively use a bigger sheet. If this should happen, please look under the topic "COARSE MEANS". If your shots land in the middle of the target, shoot more strings to ensure that the performance is consistent. If not, proceed to fine-adjust the sights as necessary. If you want to visualize the adjustment, you can imagine the sights, bore axis and line of sights with their relationship grossly exaggerated, or you can draw a simple diagram on paper. "The front sight goes where the shots went" is a useful mnemoniac for adjustments. If the BBs hit below the centerline, the front sight should be lowered to raise the PoI. Usually the front sight post is turned clockwise to screw it in. If the shots hit the target on the left side, move the front sight to the left. 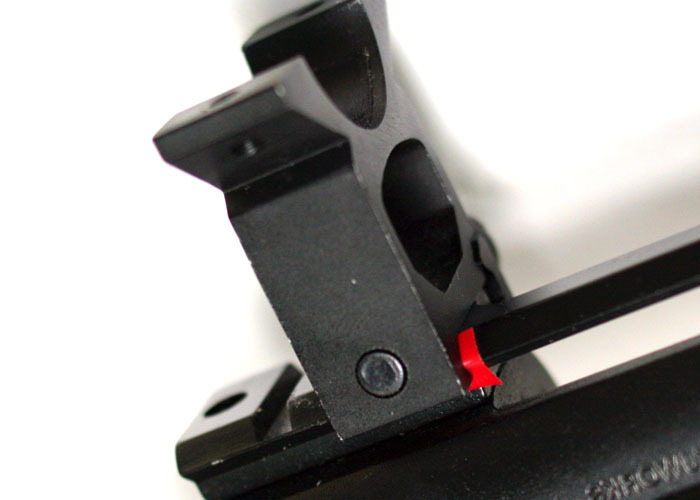 REAR SIGHT "The rear sight follows the center" is the idea for adjusting the rear sight. If the shots are hitting the target too high, lower the rear sight. If the shots are going to the right, move the rear sight to the left. It's really this simple! With handguns, errors in shooting technique can shift the grouping in any direction, so if the pistol appears to be dead-on from a rest but the groupings shift when you shoot off-hand, don't cheat yourself by aiming off or adjusting the sights! Many right-handed shooters shoot to the left and southpaws to the right, because the trigger finger makes an arc but the trigger moves on a linear axis back and forth. Imagine pulling the tip of your finger towards the aiming eye to cure this. When you dry-fire a handgun, the sight picture should not move to either side. Sometimes the adjustment range of sights is not enough to make the point of aim and point of impact meet at any range. Bearing in mind that optics are originally designed for real rifles, which can put five rounds in a 25mm (1") circle at 100 meters (328 feet), the adjustments are very minute so the user is able to make minute changes to the exact PoI. If you have an airsoft rifle that shoots 20 cm (8") off from 20 meters (65 feet), it is unlikely that you will be able to correct that with fine-clicks on a scope. After truing the barrel as straight as you can, you should look at the scope mount rail and rings. 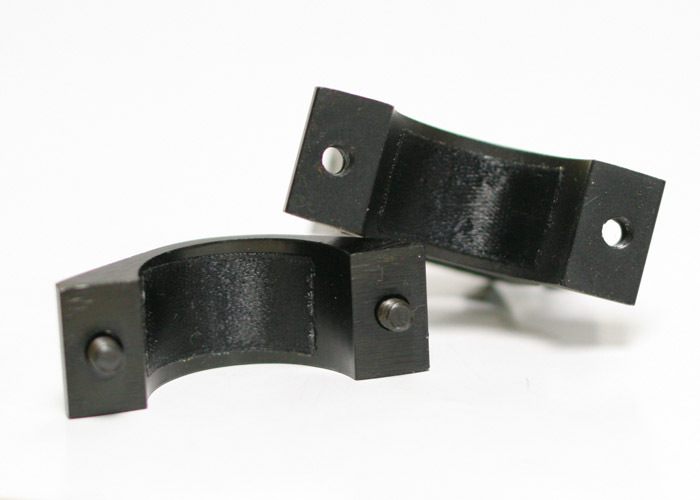 Thin shims under the front or rear of the scope rail are perfect for correcting elevation. The side of a coke can is 0.08 mm thick, so it's still not fixing a small problem with a big hammer. A need to correct windage with these means is less common, but still possible. The rail usually can't be shifted sideways, because the shape aligns it with the receiver. You can use "can shims" or tape to offset the scope mount rings ever so slightly. The shim should be placed between the solid side of the claw of the ring, because on the loose side it won't do anything. This adjustment method should not be overdone, because offsetting the scope rings can cause torsion on the scope tube. You can also put tape on one side between the scope tube and mount ring to align the scope. After you have found the correct fix to align your sights, you may want to lock them in place. Unless you're using expensive real-steel parts, it is quite possible that the zeroing point is lost simply from detaching and attaching the scope, so secure all screws with blue Loctite. Don't use too strong agents for this! 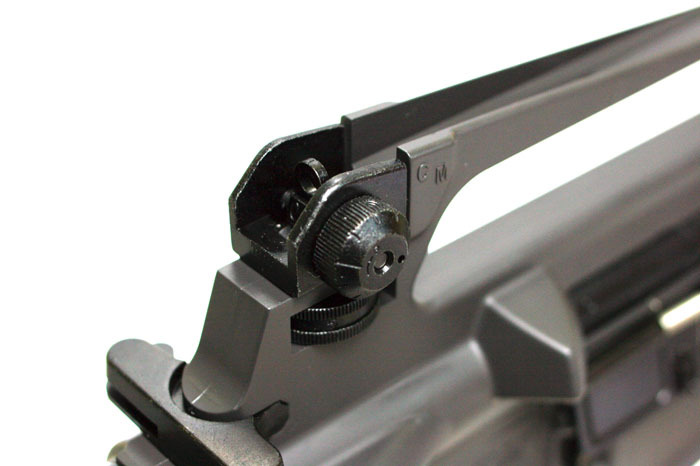 Once the coarse adjustments have brought you close enough to where you want, you can go back to "ADJUSTING THE SIGHTS" or "OPTIC SIGHTS" for fine-tuning of the dials of the sights. Having the weapon hit what you aim and knowing it is a great psychological advantage in the field. Combined with shooting practice with targets it will improve your success as a player. While shooting skill alone isn't all there is to surviving in the field, it's a good start. If you are frequently in a situation where you were stealthy enough to spot the opponent first but missed them when you pulled the trigger, you know what to do!